I woke around 10am to find out that I had more time than I thought left at the apartment before I was kicked out. 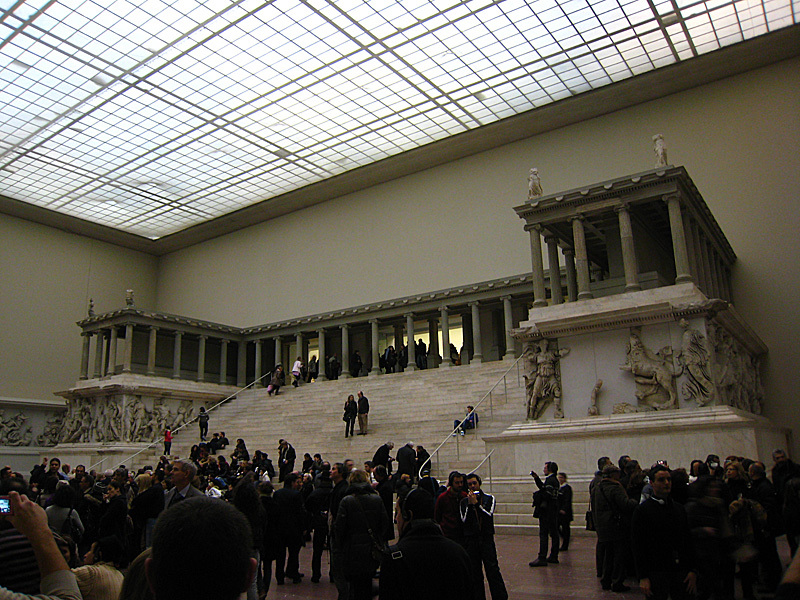 I decided to make good use of the extra time and go to the Pergamon Museum on Museum Island. I got there around noon and the queue was about half a futbol field long. But I met some friendly Irish men in Berlin for the New Year’s parties and we talked about our experiences the night before. It surfaced that all of us were amazed at how many people were down at the Brandenburg. Their names were Connell, Colin, Brian, and alas I forgot the last one’s name. But they were pretty chill. We got into the museum rather fast, less than an hour of waiting. I took the free audio guide as did some of them. As it was an individual thing, we said farewell just in case we didn’t see each other anymore and we each went to explore the museum. 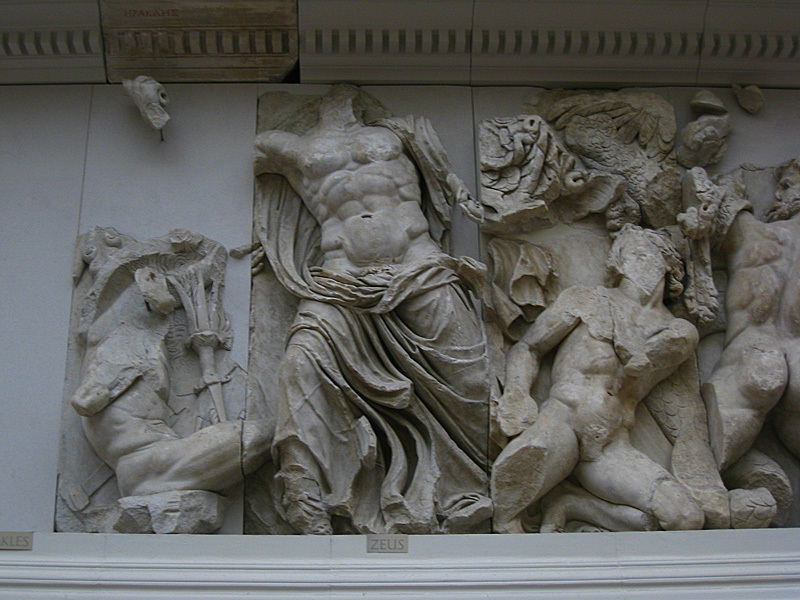 The Pergamon Altar from the ancient Greek city of Pergamon. This is the original altar, at least what is left of it. 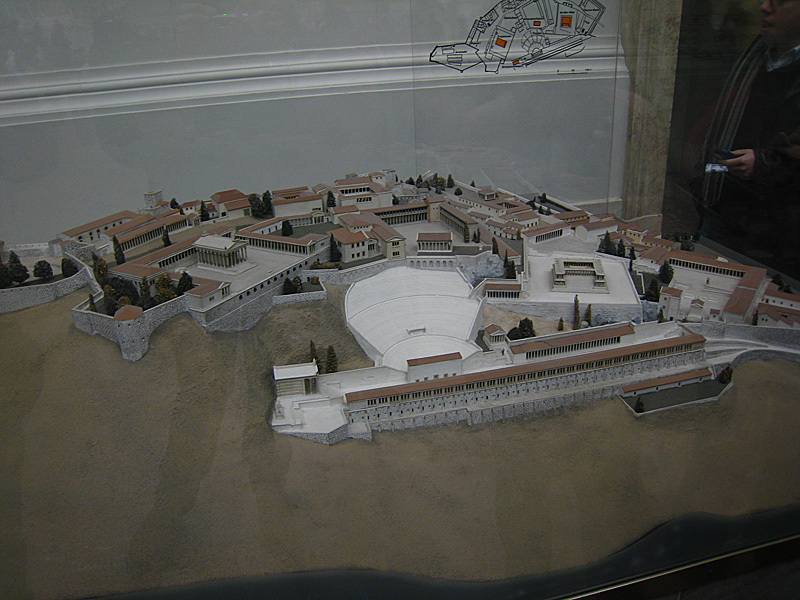 A model of the city of Pergamon. The altar above is located in the lower right corner of this model. 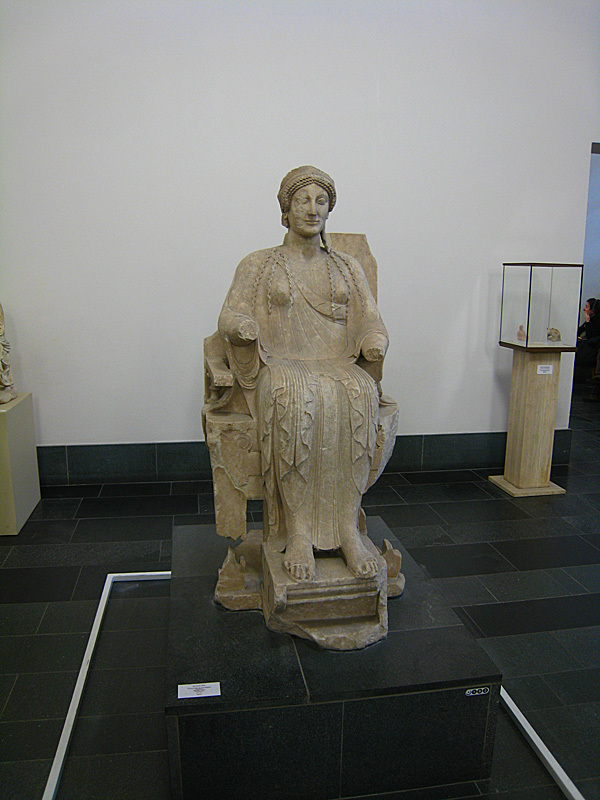 This, among a few other pieces bordering this museum room, are what remains of the decorative outer walls of the pergamon base. Zeus. The Greeks even labeled each of the characters in these sculptures above each of them to help visitors. The label here has been added by the museum. 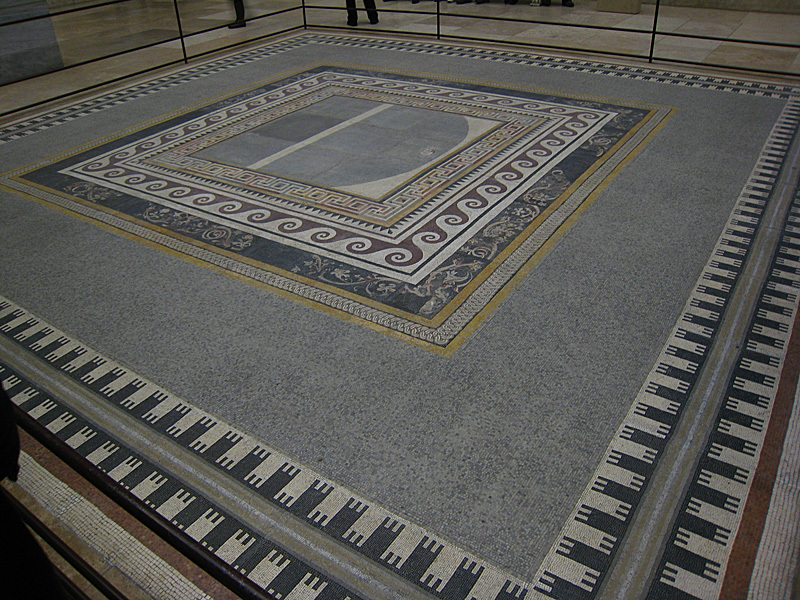 A rare, Greek mosaic. Close to the center one can see what looks like a scrap of paper (it’s not). The artist signed his work there. 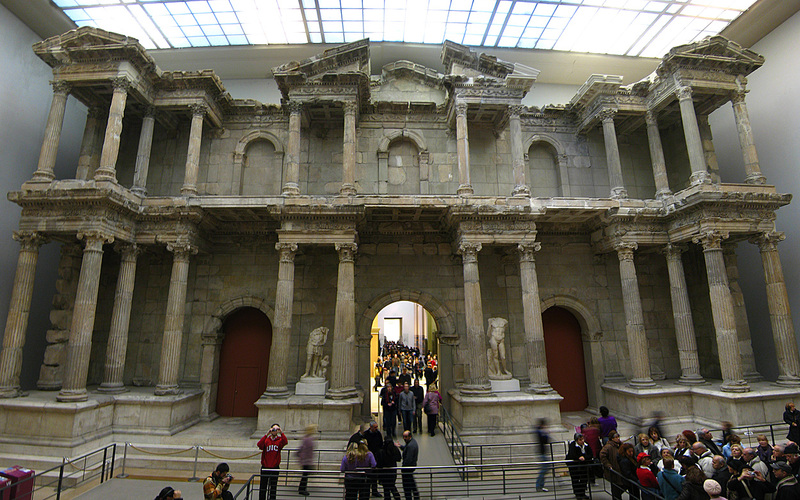 The market gate of Miletus. It dates from about 120AD. Walking through this museum made me feel like I was some kind of archaeologist. It was awesome. 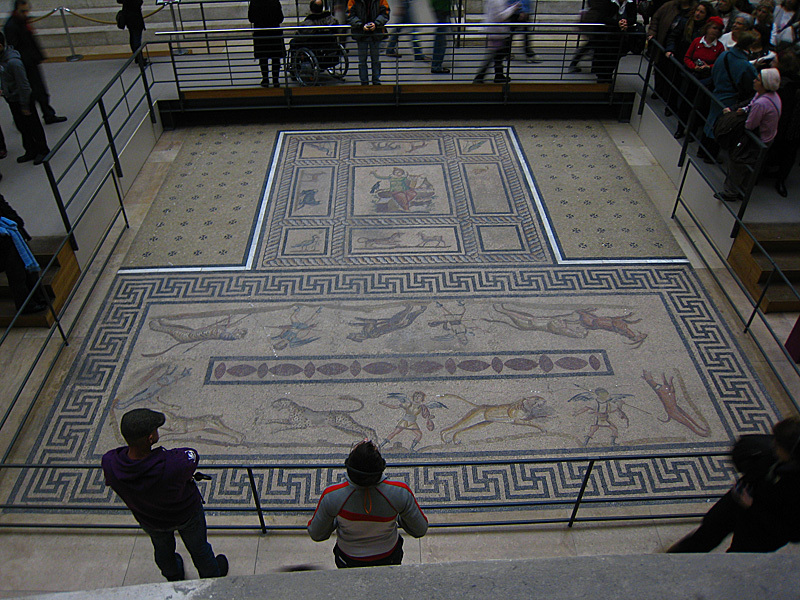 Another Greek mosaic. This one laid in the ground of an eating room. The upper corners are simple looking because that’s where couches stood so the guests could lounge before the meal. But through the market gate was the exhibit I came here to see. 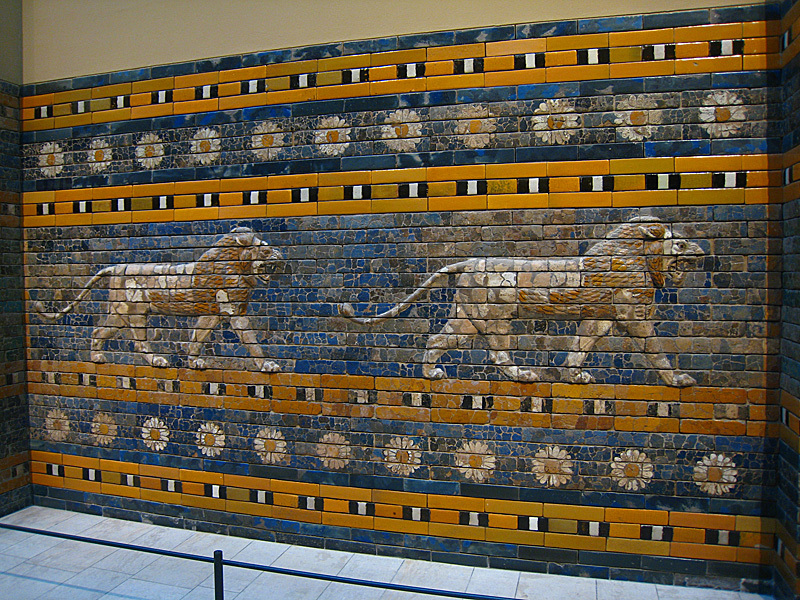 Artifacts from Babylon. Babylon, from 2300BC. That’s legit. The walls of the processional way from the city of Babylon. 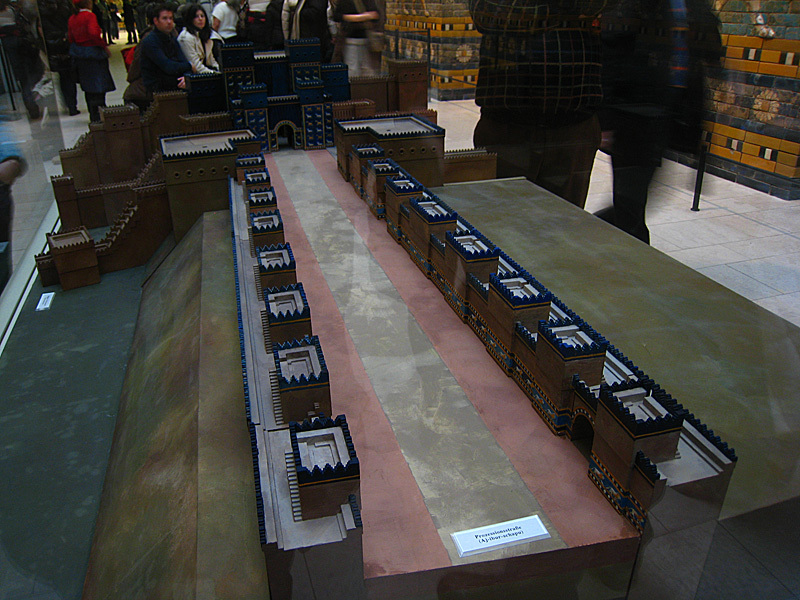 A model of the processional way and the Ishtar Gate. The museum had the lower and upper parts of the processional walls lined up: the part with the lions and the tops of the walls. And already it was taller than me. Also, the corridor was not as wide as the real processional way. 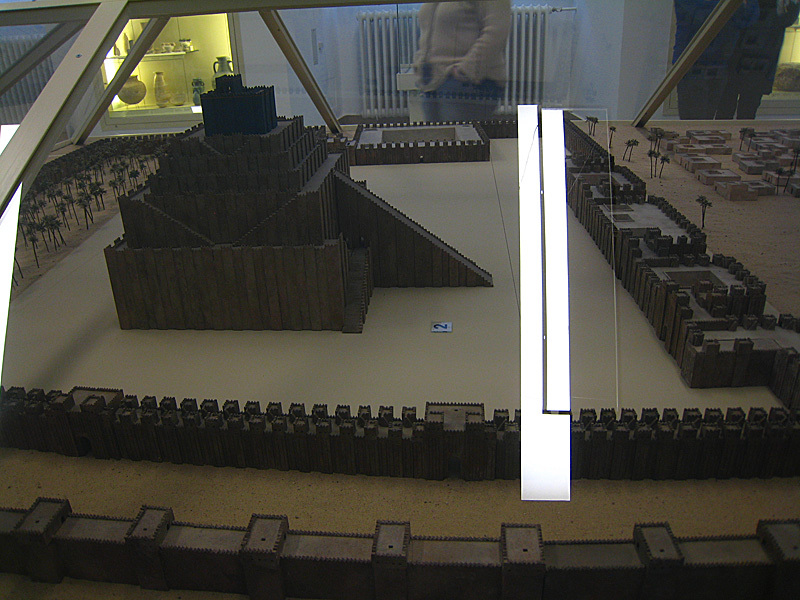 The walls in the museum stood at the edge of the red on the model. It was still intimidating. 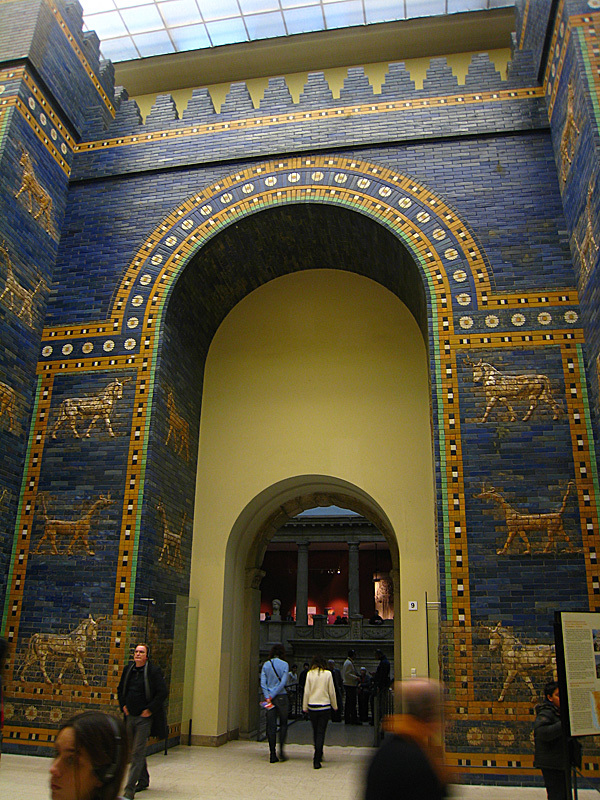 The Ishtar Gate was even on display. Pretty sweet if you ask me. A model of the Tower of Babel. At least what scholars think it looked like. There were at least two kings who added to the tower hence the different colorations on separate levels. Mshatta facade from the Qsar Mshatta palace, one of the desert castles in Jordan. It dates to around 8th century AD. I think my next trip should be to one of these ancient worlds. They fascinate me beyond belief. I like trying to imagine what it was like back then. And then the realist jumps in front of my mind and informs me of how terrible everything was. Persephone, what’s left of her. At this point, I looked at my watch and realized I needed to get back so Susanne didn’t lock the doors on me with my stuff still inside. But when I returned to the apartment, Urs had come back from Switzerland and I was welcome to spend as much time as I wanted. So I stayed the rest of my time in Europe in his apartment. No, not really. But I should have. Urs knows Berlin like the back of his hand. And not the tourist parts that one can familiarize himself/herself with by picking up one of those tourist maps. I’m talking about the real Berlin, the living Berlin. Urs bought this apartment over 10 years ago and has seen East Berlin evolve since the wall fell. He knows the history of the underground clubs and bars that have arisen over the years and moved farther away from the center maintaining their identity while other more proper bars, and flagship stores continue to populate the center area. Oh, and he has some really cool music. And a pretty dope setup in his house. Floor speakers in every room all connected to one central system so you can rock out throughout the house as you pass from one room to the next. When I came back in the evening after buying my train ticket, I could hear his music from the lobby of the apartment building. It was bumpin’. Lucky for me he invited me to dinner, so we rolled out at about 9pm. He took me to this Indian food place where he was pretty much a celebrity. Urs walks over to the table he wants to sit at and we sit down. The waiter takes his and my orders for drinks while I peruse the menu for some foods. No sooner had the waiter disappeared around the corner with our food orders, does he return with our dishes sizzling from the kitchen. The two dudes at the table next to us were not thrilled (they were sitting there when we arrived and had not yet gotten their food; they got their food within a minute of us getting ours though). On top of this great service, the food tasted amazing and the music was cool too. I got Tandoori chicken and tried putting some spicy pepper sauce on a couple of bites. Everything was delicious. And I learned a lot about Berlin, the unique clubs it houses, one of which saw the birth of techno music. Now I must go back to Berlin and go to that club. Afterward, we stopped at a bar near his flat called Erdbeer. It’s a play on German words as Erdbeere translates to strawberry. So the walls were painted red. The seats were super old and deteriorated, the lights were dim, none of the fancy bars that Urs argues does not have as much life in it. He convinced me of such. This place had a personality of its own and the atmosphere was warm and friendly, people of all ages lounging and conversing throughout the bar. The building it’s housed in was originally a butchery and so one can sit back where the meat hung up (the meat is no longer there though). I’m now convinced Berlin is one of the most living cities I’ve visited. I’m gonna have to come back for sure and go to all these cool places. What’s more is that a lot of this sort is really close to his flat. The Erdbeer bar was literally just around the corner. Anyway, I had a great last night in Berlin and immediately fell asleep upon returning back to the flat as I had to catch a 454 train to Prague in the morning.